The Earth reached its Perihelion today at 12 UTC, which is 7AM Eastern Standard Time. This is the point in the planet’s orbit where it comes closest to the Sun. While the planet’s distance from the Sun is not responsible for the seasons, it does influence their length. 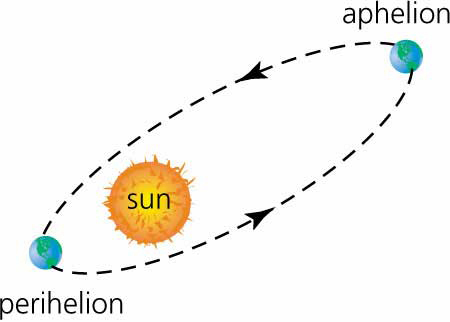 As a function of gravity, the closer the planet is to the Sun, the faster it moves. Today, the Earth is about 146 million kilometers away from the Sun. That is approximately 5 million kilometers closer than in early July. This position allows the planet to speed up by about one-kilometer/second. As a result, winter in the northern hemisphere is about five days shorter than summer. This entry was posted in weather and tagged definitions, explainer, seasons, space, stats by Melissa Fleming. Bookmark the permalink.